Citation Information: JCI Insight. 2019;4(2):e123390. https://doi.org/10.1172/jci.insight.123390. Psoriasis is one of the most common skin inflammatory diseases worldwide. The vitamin D3 analog calcipotriol has been used alone or in combination with corticosteroids in treating plaque psoriasis, but how it suppresses psoriatic inflammation has not been fully understood. Using an experimental mouse psoriasis model, we show that topical calcipotriol inhibited the pivotal IL-23/IL-17 axis and neutrophil infiltration in psoriatic skin, and interestingly, such effects were mediated through the vitamin D receptor (VDR) in keratinocytes (KCs). We further reveal that IL-36α and IL-36γ, which have recently emerged as key players in psoriasis pathogenesis, were effectively repressed by calcipotriol via direct VDR signaling in mouse KCs. Accordingly, calcipotriol treatment suppressed IL-36α/γ expression in lesional skin from patients with plaque psoriasis, which was accompanied by a reduced IL-23/IL-17 expression. In contrast, dexamethasone indirectly reduced IL-36α/γ expression in mouse psoriatic skin through immune cells. Furthermore, we demonstrate that calcipotriol and dexamethasone, in combination, synergistically suppressed the expression of IL-36α/γ, IL-23, and IL-17 in the established mouse psoriasis. Our findings indicate that the combination of calcipotriol and corticosteroid efficiently disrupts the IL-36 and IL-23/IL-17 positive feedback loop, thus revealing a mechanism underlying the superior efficacy of calcipotriol and corticosteroid combination therapy for psoriasis. Calcipotriol represses IL-36α/γ expression in mouse epidermal keratinocytes and human primary keratinocytes. (A) Calcipotriol but not dexamethasone represses IL-36α/γ expression in ex vivo cultured mouse epidermis in a keratinocytic VDR–dependent manner. Data show the qPCR analyses of cultured epidermis from WT Balb/c mice (left panel) or from VdrKC+/+ and VdrKC–/– mice (right panel). Values are mean ± SEM. *P < 0.05; **P < 0.01; ***P < 0.001 (2-tailed Student’s t test). Data are representative of 2 independent experiments with similar results. (B and C) Calcipotriol represses IL-36α/γ expression in human primary keratinocytes (HPKCs). 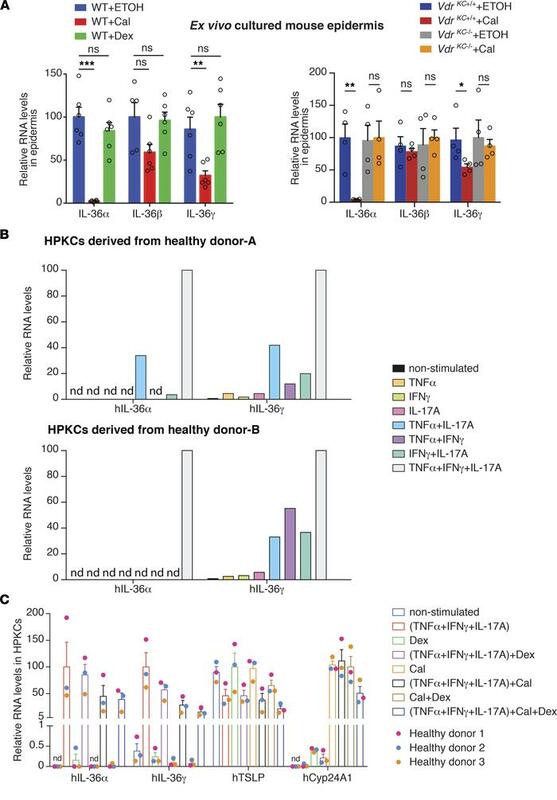 (B) HPKCs derived from 2 healthy donors were stimulated HPKCs in the presence of TNF-α, IFN-γ and IL-17A, alone or in combination, and they were examined the induction of hIL-36α and hIL-36γ. (C) HPKCs derived from 3 healthy donors were stimulated with cytokine cocktails (TNF-α+IFN-γ+IL-17Α), in combination with calcipotriol (Cal), dexamethason (Dex), or both for 24 hours, and gene expression was analyzed by qPCR. Dots with the same color (red, blue, or orange) represent HPKCs derived from the same donor no. 1, 2, or 3.